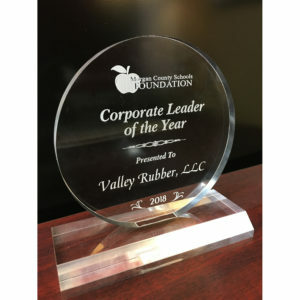 Decatur, AL – Valley Rubber was honored with the Corporate Leader of the Year award at the 3rd Annual Morgan County Leadership Hall of Fame Celebration Banquet. In an effort to promote a culture of leadership and character building within the community and schools, the Morgan County Schools Foundation presented this award along with the Community Leader of the Year Award, and also inducted four people into the 2018 Leadership Hall of Fame. Hall of Fame inductees included: Judge David Breland, former Mayor Lynn Fowler, Decatur Youth Services Director Bruce Jones, and local businessman Jimmy Smith. Judge Breland served on the bench for twenty-five years, Lynn Fowler has been active in the community since 1978, Bruce Jones has worked with local students for over twenty-three years and Jimmy Smith is credited with promoting tourism in the county. This year’s Community Leader of the Year was awarded to Phil Waldrep. Valley Rubber was honored to be recognized along with such distinguished recipients.